Don't be fooled by the name "blue moon," however. Most likely, the moon will look gray or white as usual, but it will be a full moon. The moon rises in New York Thursday at 7:28 p.m. but sets at 6:05 a.m. Friday, just before it becomes completely full (6:43 a.m). It will appear again in the sky at 8:14 p.m. Friday -- the day of the official "blue moon," though it won't be at its peak. Blue moons are not actually defined by their color. Instead, by popular definition, a blue moon is the second full moon in a month. The phenomenon only happens every few years, making it a relatively rare occurrence. The first full moon of the month happened July 1 for those in New York. A moon that appears blue is caused by dust in the atmosphere, according to Larry Ciupik, an astronomer at the Adler Planetarium in Chicago, Illinois. If the atmospheric conditions are just right on Friday, then the blue moon may appear slightly blue in color, but Ciupik says that isn't likely to happen. Be sure to set your gaze skyward Friday night to catch a glimpse of the rare blue moon that will hover atop the Chicago area after sunset. But don't be fooled by the name "blue moon," because if you're looking for a moon that is actually blue you won't find it. 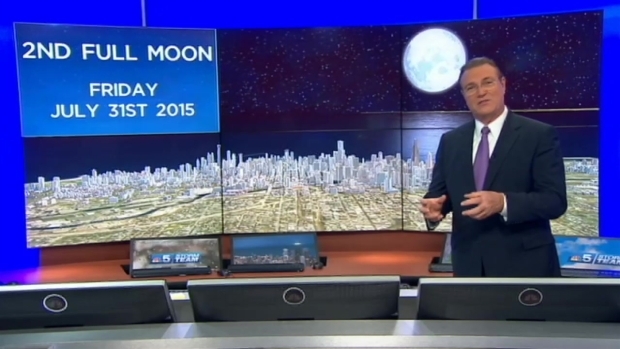 NBC Chicago's meteorologist Brant Miller explains.